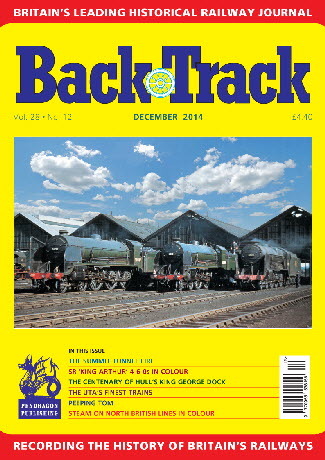 Railway Magazine | BackTrack December 2014 journal from Pendragon Publishing. The UTA's Finest Trains - Colm Flanagan writes about Northern Ireland's classic diesel-electric railcars introduced in 1966. Berkshire's Least Known Branch Line - Paul Joyce describes Reading's goods branch and depot. Inferno under the Pennines - Mike Bunn tells the story of the fuel tanker train fire in Summit Tunnel in December 1984. A Sideshow of a Sideshow - Geoffrey Skelsey presents a World War I postscript involving Lawrence of Arabia and the Hejaz Railway. Peeping Tom - tales of nefarious activities on compartment trains told by John C. Hughes. North British Whereabouts - a colour spread of steam on NBR lines from the camera of David Idle. Arthurian Legends - four colour pages featuring the SR 'King Arthur' Class 4-6-0s. Eric Bruton on the West Coast Main Line - four pages of archive photographs from the 1950s by one of our foremost photographers. Tickets, Please! - Geoffrey Skelsey looks at the world of the traditional card railway tickets. The Isle of Wight Railway Closures - Part Two - Edward Gibbins concludes his investigation of the demise of the island's railway system. From the 'Met' to the Mersey - R. A. S. Hennessey explains how wartime necessity brought London Transport stock to the Mersey and Wirral lines. The Centenary of Hull's King George Dock - Mike G. Fell traces the history of this railway-owned dock which opened in 1914. The Testers - Don Rowland recalls the 'running in' of locomotive overhauled at Crewe Works.